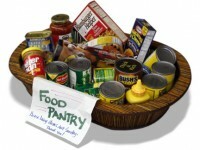 Our food pantry provides food to individuals and families in need. Our customers are often no different from you or I. They are adults who may have difficulty paying rent, utilities, or other household expenses and simply need assistance to make ends meet. Last year alone, Faith food pantries served 1,282 people! To utilize the food pantry, the customer must provide a FL drivers license, a utility bill or some other form of identification reflecting a local area address. They may visit the pantry once every 60 days for up to one year. We are open to the public Monday, Wednesday, and Friday from 9:00 am – 11:30 am. *Please use the navigation links at the bottom of the viewer to see additional months.